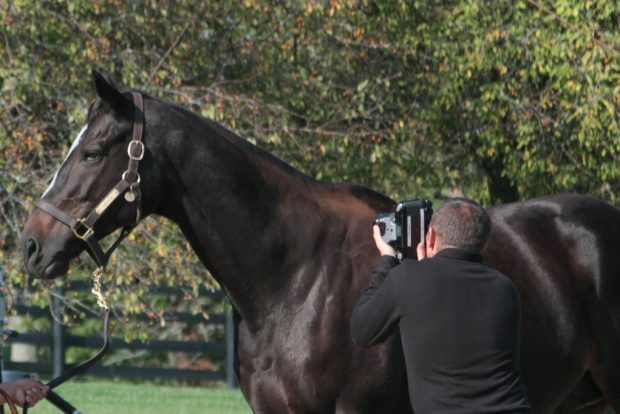 Neil Latham photographs Zenyatta at Lane’s End Farm. For fine art photographer Neil Latham, his mum was the most powerful and soulful woman he had ever encountered, so when he noticed similar qualities among grazing horses in upstate New York while grieving his mum’s passing, he did what came naturally: he took a few photographs. The shots captivated Latham – there was strength yet fragility, athletic supremacy with graceful movement, determination yet peaceful confidence. He sensed his mother’s presence. He was struck by a compulsion to capture the essence and mystique of the Thoroughbred on film, honoring these magnificent animals and his mother at the same time. Yet over thousands of miles, 100-plus horses, 6,000 images, and countless equipment trials and set rotations, it wasn’t until Latham met Zenyatta that the original objective crystalized for him. In order to reveal the profound, transcendent element he sensed beneath the surface of these complex animals, Latham fine-tuned his artistic vision, resolved technical issues and sorted logistics. He convinced horse owners and trainers to let him photograph their multi-million-dollar racehorses, and crisscrossed the country loaded with equipment. He slept in the groom dorms at Saratoga Race Course and camped in a tent at Kentucky Horse Park. “I had to live it and wait for the special moments,” he says. To achieve absolute perfection, Latham experimented with photographic equipment, light, exposure and large-scale sets. He built a portable studio with a black backdrop 20 feet tall and 36 feet wide that had to be rotated every 15 minutes to maintain the perfect angle to the sun. He also shot stampeding horses to capture intrinsic wildness, with the swirling dust giving a magical element. In the process, Latham visited storied horse farms including Lane’s End, Gainesway, Stonestreet, Coolmore, Spendthrift, Ramsey, and Adena Springs. He photographed Thoroughbred legends such as A.P. Indy, Curlin, Tapit, Rachel Alexandra, Ghostzapper and American Pharoah. Black-and-white images revealed isolated musculature after a good breezing, architectural lines and curves, frenzied running, and more as he pushed the artistic limits of the subject matter. Some images nearly resemble equine versions of Robert Mapplethorpe photographs. Behind the scenes at Zenyatta’s photo shoot. 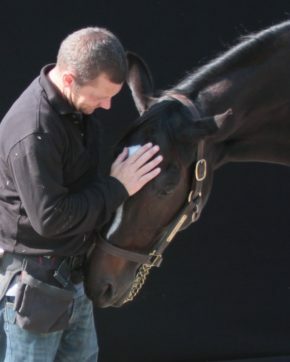 Latham and his assistant were shooting in California when approval came in to photograph Zenyatta. Excited, they drove for 34 hours straight, swapping driving and sleeping, arriving at Lane’s End Farm just four hours before the start of the scheduled session. When Latham asked a handler to take a photo of him with Zenyatta at the end of the session, something quite unexpected and extraordinary happened. “She tucked her head under my arm and just stayed there. 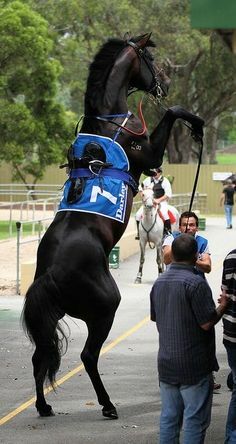 A Thoroughbred would never do this. Then she tilted her head and looked straight at me. It was like she was talking to me through her eyes. I knew she understood people and felt emotion, and it seemed like she was in touch with my inner thoughts and feelings. This was a revelation…she connected with me on a different level. And I felt something I had never felt before with a horse,” he says. As the moment ended, Latham knew it was the end of the journey, too. He had captured the essence of the Thoroughbred. Latham’s iconic portrait of Zenyatta is currently featured in an exhibition, “Neil Latham: American Thoroughbred,” at Steven Kasher Gallery in New York City through July 30. Gallery hours are Monday through Friday, 10 a.m. to 6 p.m. Address: 515 W. 26th St. in Chelsea. www.stevenkasher.com/artists/neil-latham. Limited edition prints are available in a few sizes ranging up to 50 x 60 inches for maximum impact. They are numbered, finished on archival paper with museum framing, and signed by the artist. Zenyatta is also a highlight of the limited edition fine art coffee table book “American Thoroughbred” by Neil Latham published by Twin Palms. It features 182 pages with 80 duotones, and is casebound and slipcased for quality presentation. It retails for $95 and is available from the publisher at https://twinpalms.com/books-artists/american-thoroughbred/ or from Amazon (ISBN: 978-1-936611-12-6). It can also be purchased at the Steven Kasher Gallery in New York through the end of July. American Thoroughbred has developed quite a following on Instagram, see @neil_american_thoroughbred. The photographer’s website is www.neillatham.com. Judy, Thank You so much for letting me know. Went right there to see him. Thank You again so much.. Yes he has my heart. Thanks for the link. There are some beautiful stallions in this slide show! Orfevre is gorgeous, and Lord Kanaloa is a stunning bay. Oh who am I kidding — they are all magnificent! Dear Janet, Just can’t tell you how much I Thank You. Just Love Orfevre so much. They are all just beautiful.. Made me so happy to see him. Dear Ms. Janet – Thank you for this link. These horses absolutely are breathtakingly handsome stallions. The sons of Sunday Silence…….. Gorgeous. They are all stunning. Thanks. I must thank you Mr. Latham for capturing the soul and the beauty of our beloved Zenyatta. Beautifully descriptive words by you … how she captured your heart forever. What a gorgeous book . All of the horses ( and I’ve seen some of the other photographs perhaps from his website or another horse commentary blog) are just amazing, but to me Zenyatta is the star. For every fan who has seen her in person or who may have only seen her on television or via the internet or photos …. We are all in her loving emotional embrace. She exudes love and beauty and kindness The world is an infinitely better place because she resides peacefully in a Kentucky farm. Everyone is a better person for knowing her. May she be blessed with a long and happy life. She is very special and we all need her in our lives. And for those of us lucky enough to have watched her race and be there when the stands shook…….. Unbelievable. Thank you Lane’s End for this post today. We often question why something happens to us, even though it’s clear we’ve ignored the warning signs: stay clear of certain situations, avoid certain foods or drinks, avoid associating with certain people. We simply didn’t use our common sense. The artist doesn’t paint sewage or trash but waits to paint something beautiful on the canvas. We are artists in our own way, deciding what we will paint on our canvas of life. When we don’t discriminate, when we daub on and dip into ugly colors, we end up painting a picture that has to be done over. Often we paint with ugly colors simply because they were there or because other people were doing it. We are too lazy to paint something beautiful, or we’re afraid our painting will be “different”-and we don’t want to be different. Yet we need always to listen to the spirit within, which knows which colors to choose, what actions to take. When we do this, we will feel peace in our hearts. There will never be peace between nations…until there is true peace in the souls of men. Dear Kathy.So true unless men have peace in their hearts there is not much hope for us.I don’t know how we survived yesterday we were in meltdown!A soldier died again while training on the Brecon Beacons same happened in 2013 when 3 died on the hottest day of the year.It has cooled down but I have a terrible headache with the thundery atmosphere. Disappointed to hear Postponed is out of Saturday’s big race with a respiratory infection.Her Majesty’s Dartmouth is now favourite.Get well soon beautiful boy.Sheena. Very sorry my message got posted twice. God bless you and God bless Ceri Sheena! DEL MAR, Calif. — Dortmund has won 8 of 10 starts, six stakes, and has earned $1,712,480 so far in his career. “Eight of 10, not many do that,” owner Kaleem Shah said. On Saturday, Dortmund is scheduled to have his first start of 2016 in the $200,000 San Diego Handicap at 1-1/16 miles, a prep for the $1 million Pacific Classic on Aug. 20. Dortmund’s return will be overshadowed by the comeback of California Chrome, the 2014 Horse of the Year, who has not raced since winning the $10 million Dubai World Cup in March. Judy B; I wish the best for Dortmund in another race but CC has always been my boy! This is a tough one for me cause I’ve been in love with Dortmund from the get go and I adore CC. Thanks for the post. My heart is with Chrome but wish Dortman and all the others a nice 2nd place and/or a safe trip. Happy Dortman has Gary Stevens up. He will take care of the big guy. I don’t know much about this project but I have been watching the live feed the last two days and am concerned about Ceri. It looks like she has injured her left wing (it’s dragging). If she can’t fly than she won’t be able to get food or water. That is serious. Is there anyone from this program who is going to go get her to treat the wing and feed her? I noticed she has been leg band so she has been handled in the past. We have wildlife sanctuarys here that have rescued large birds like eagles, Falcons etc. I hope they don’t wait too long…. she is still alert this morning but her wing is definitely injured and I think they can treat it (even if it is broken) and they can get her food and water. She seems like a sweet bird. What a wonderful thing for him to feel that with our beautiful and soulful Zenyatta .Nice to have a professional recognize her special abilities . This article actually made me feel joyous and tearful at the same time . I miss her .. thank you for this wonderful article . Judy B; DeCoronado looks so awesome. Thanks bunches for the photo of De Coronado. He certainly has the family resemblance and has a lovely color! Good Luck to him always, and may he be safe and sound. What a presence — just stunning! Thanks for posting this “Big Beast understudy”. Dear Zenyatta my lifetime mare horse, I saw a video of you dancing today on face book. OH, I have seen it before and it was my favorite of you. You most certainly rocked in racing and then you have rocked as a wonderful Momma. I will never forget all the wonderful moments past and always look forward to all in the present. Sad news from the Dyfi group tonight. Just around midnight, Ceri lost her battle and passed away. So sorry to hear this. Sheena so sorry. Very sad news. So sorry about the loss of Ceri; I was hoping she could come around and be all right. RIP young Ceri, you were just beginning. Thinking of you tonight, Sheena, with comforting thoughts. Rest In Heavenly Peace to The Chili Man, and Monique Snowden his trainer. Such tragedy’s. Rest In Peace Monique. To Dean Reaves so sorry for the loss of this wonderful 2 year old prospect. So hard to take with a horse being put down. Hurts the heart so bad. This is just horrible — a double tragedy. RIP The Chili Man and RIP Monique Snowden. Condolences to all who grieve. Here is a link to The Bloodhorse article. So heart breaking. Every time I think of it I just cry and my heart hurts for everyone at Emerald Downs. I don’t know what else to say. An ordinary lizard about four or five inches long, with green and brown stripes along his shiny body, patrols the area around my window. He is diligent. He is industrious and can bend his body in many ways to get into crevices where bugs may be hiding. Where there’s a will, there’s a way, as the saying goes. The lizard’s will is his stomach. He can’t afford to wait for legislation to give him food. His whole existence depends on making it happen by his own will and determination. This lizard acts like a hunter, thinks like a hunter, and works to prove he is one. He looks for bugs more intently than most of us look for solutions for our problems. Both bugs and solutions float around us all the time, but we are wise to leave the bugs to the lizard and instead to focus on catching the solution to our problems. We live close to our great mother, the earth. Wise Dan to receive ‘Comeback’ award – Rood and Riddle. He looks wonderful! Congratulations to “the Most Interesting Horse in the World”, Wise Dan! You certainly deserve this Comeback award, big fella. How exciting it will be for everyone present at the Kentucky Horse Park on July 30th to be able to see the magnificent WD in person!! Dear Kathy.Great devotional.Such sad news this morning.I had checked on Ceri before going to bed about 11pm and she was shaking her head.I just touched the screen and prayed.I think they knew there wasn’t much hope of her recovering that’s why they wanted her to be safe in the nest.She twisted her head and lifted her tail and just stopped breathing.Maybe there were internal injuries.Looking back it was a nasty fall.I am glad she is at peace now.